An increasing number of US cities have adopted a Climate Action Plan (CAP). Just to name a few: Portland, Oregon; Chicago, Illinois; Boston, Massachusetts; and Minneapolis, Minnesota have adopted rigorous plans that define the threats Climate Change poses to their cities and how they plan to approach these issues. Although Climate Change is going to warm our planet’s entire atmosphere, it’s going to affect each community differently. Increasingly, cities will experience some combination of water shortages, more flooding, more public health issues due to their particular geography, finances, populations, and infrastructures. So every community should have their own CAP. A CAP isn’t just a sustainability plan that includes Climate Change; it’s a climate action plan that defines how sustainability must be viewed through the lens of Climate Change. For example, existing infrastructures—highways, water pipes—must not only be maintained, they must be made more resilient for the challenges coming. 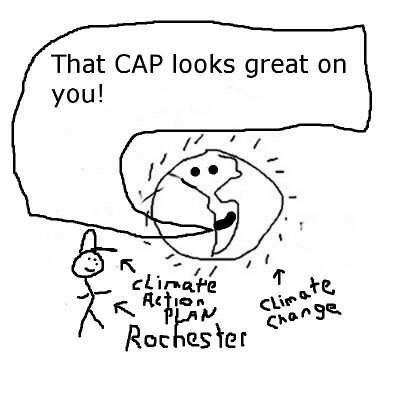 A CAP is an official acknowledgement that our collective attempts at sustainability must be tailored to a quickly warming world, not simply carrying on in the previous world where the prevailing opinion was that humanity’s actions didn’t disrupt our environment (our life support system) much. A CAP should identify sources of a community’s greenhouse gas (GHGs) emissions, which makes it more likely we will find solutions for reducing a community’s carbon footprint. A CAP should identify those members of the community who are most vulnerable to the local effects of Climate Change. For example, in a heat wave it is critical that there is a system in place to identify and inform isolated folks who need to get relief from the heat. A CAP can bring to the local public’s attention the specific ways this worldwide crisis affects them. This increases the likelihood that climate disruptions around the world will bring humanity together under a common threat, making solutions possible when we work together. A CAP provides an opportunity for various elements in our society to make their voices heard, their vulnerabilities known, and their actions inclusive. For example, folks in a poor neighborhood should have representation in a CAP to facilitate actions by the larger community that will actually work for all on a level and time frame that will matter. A CAP represents to the local media a way to measure the actions of our public officials against the plans in place to address Climate Change. 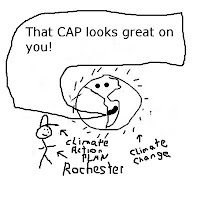 A CAP would also alert the local media that connecting the dots between Climate Change and local climate disruptions are now a continual part of their job description. A CAP closes the door on climate denial. For example, a CAP sends a message to the public that their leaders understand the science behind this worldwide crisis and are ready to act in the public’s interests. Climate denial then becomes the pariah message that it is, allowing peer pressure to stop it altogether. A CAP connects one community to another with solutions that may be accelerated and fortified by sharing tactics and strategies. For example, solar power is understood as a wonderful energy option that will provide many jobs and significantly reduce GHG emissions. But many local codes and large utilities hamper efforts for this decentralized energy option. A CAP could level the playing field for renewable energy options and help clear away obstacles thrown down by those who want fossil-fueled business as usual. A CAP sends a message to the public that many long-term projects to maintain and fortify their infrastructures for more extreme conditions will require their understanding, patience, and support for adequate adaptation. A CAP sets the stage for the business community that makes environmental regulations and practices predictable. A CAP can also suggest to many new businesses the proper direction for new products that will help a community adapt. A CAP helps the public understand that many of their activities—what they buy, what they eat, and how they travel—are integrally related to our communal effort to address Climate Change. A CAP, however, is just a piece of paper with no legal authority. But then so is the Declaration of Independence.